The biggest enemies to fine cigars are the wrong humidity level and fluctuations or cycles in humidity. The first problem is caused by the environment while the second is caused by the products that attempt to control it. Humidity fluctuations are caused by the normal changes in ambient temperature and humidity, whereas cycles in humidity are caused when using any refillable humidification device. Both are bad for your cigars. Boveda is the only humidity control device trusted by respected cigar and tobacco manufacturers all over the world. Boveda helps cigars to improve with age. Two-way humidity control continually responds to the environment and maintains a very stable and precise Rh. It is this stability that prevents loss of the natural oils, sugars and flavour as your cigars age. Using Boveda packs is simplicity itself. Just place the sealed packet in your humidor and presto! The ambient climate is instantly regulated to the proper relative humidity. 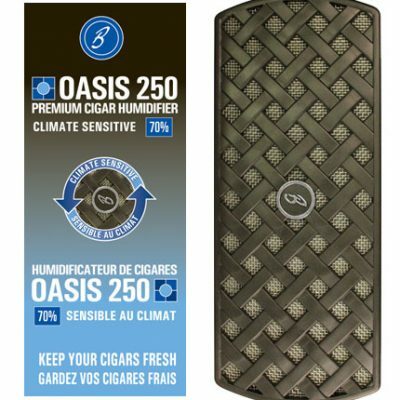 You can purchase 69%RH, 72%RH or 75%RH packets on this website; as well, a cedar holder is available, which allows you to have the packets secured on the underside of the lid of your humidor. Our 60 gram Boveda packs are the appropriate format for hassle-free maintenance of full-size humidors and Humidor Bags. Scientifically engineered to maintain a precise relative humidity in an enclosed space, and available in multiple RH levels to suit your needs. The shelf life of a pack left in its overwrap is approximately 2 years. Actual size of each packet in inches is 5.25 x 3.5. Do not mix Boveda Rh levels within the same humidor, and do not use Boveda in the same humidor with other humidification products. They will fight against each other and reduce the efficiency of the Boveda packs. 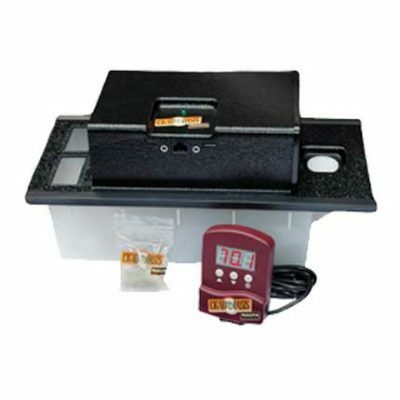 Note: For wood lined humidors the actual Relative Humidity will typically be held a few percent lower than the level printed on the packet, tightly sealed travel humidors will keep percent as printed. 2 Packs are recommended for every 50 cigars your humidor can hold. The biggest enemies to fine cigars are the wrong humidity level and fluctuations or cycles in humidity. The first problem is caused by the environment while the second is caused by the products that attempt to control it. Humidity fluctuations are caused by the normal changes in ambient temperature and humidity, whereas cycles in humidity are caused when using any refillable humidification device. Both are bad for your cigars. Cigar Boveda Packs are the only humidity control device trusted by respected cigar and tobacco manufacturers all over the world. Boveda helps cigars improve with age. Two-way humidity control continually responds to the environment and maintains a very stable and precise Rh. It is this stability that prevents loss of the natural oils, sugars and flavour as your cigars age. Using cigar Boveda packs is simplicity itself. Just place the sealed packet in your humidor and presto! The ambient climate is instantly regulated to the proper relative humidity. 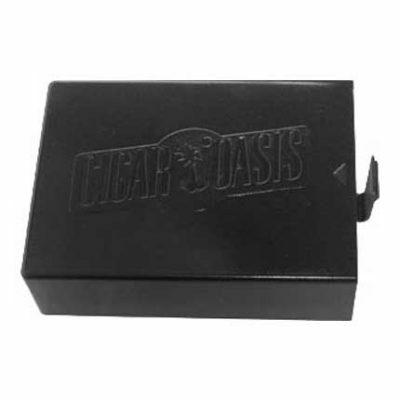 You can purchase 69%RH, 72%RH or 75%RH packets on this website; as well, a cedar holder is available, which allows you to have the packets secured on the underside of the lid of your humidor. 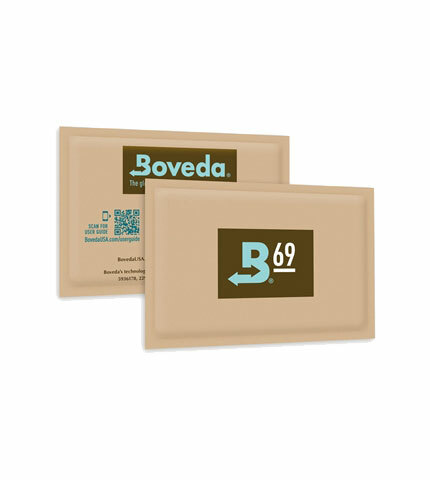 Our 60 gram Boveda packs are the appropriate format for hassle-free maintenance of full-size humidors and Humidor Bags. Boveda packs are scientifically engineered to maintain a precise relative humidity in an enclosed space, and available in multiple RH levels to suit your needs. The shelf life of a pack left in its over wrap is approximately 2 years. Actual size of each packet in inches is 5.25 x 3.5. Do not mix Boveda Rh levels within the same humidor, and do not use Boveda in the same humidor with other humidification products. They will fight against each other and reduce the efficiency of the Boveda packs. Note: For wood lined humidors the actual Relative Humidity will typically be held a few percent lower than the level printed on the packet, tightly sealed travel humidors will keep percent as printed. 2 Packs are recommended for every 50 cigars your humidor can hold.